Websites that don’t work and are hard to navigate can be an incredibly frustrating experience for any user. If they load slowly, have broken pages, or duplicate content it can deter visitors from coming back and make it less likely that the content that you’ve worked so hard on shows up in search results. Self-directed buyers are getting well over 50% of the way through the buying cycle based on web experience alone, which means that a technically sound website is incredibly important. Not only do some technical SEO issues hurt user experience, but a large amount of issues leads to a decrease in performance. Technical SEO issues often impact the entire site, but there are some cases that individual pages are impacted. Ensuring that these issues are addressed will help make your content more visible to your target audience. One way to solve common technical issues is to conduct a technical SEO audit on a regular basis. Below is some information to help you navigate through a technical SEO audit. #1 – Response Codes – 404: Heading tag not found! Let’s start with the basics – response codes. You need to have a website that can be easily used by people and crawled by search engines. If search engines are having a hard time crawling your site then it will suffer in organic performance. One area to help a search engines crawl your website is by reducing the amount of 4xx and 3xx response codes within your site. More common 4xx and 3xx response codes that we see are 404, 301, and 302 codes. The best way to fix these response codes is to update any pages that contain the link that either responds with a 404, 301, or 302 code to a live destination page on the website. By having a direct link to a live destination page, the authority will not be lost and it will provide a better user experience. Also, updating the internal redirects will help mitigate any potential redirect chains if a page happens to be changed again, and then is redirected to a different page. Redirect chains can cause a major headache for search engines when crawling and indexing a website. After resolving the response codes, it’s important to look at the on-page optimization of the website. Some of these issues can be related to general SEO tactics, but they are still important when conducting an audit. One area of on-page optimization that is often prevalent is duplicate content. I’m a pretty big stickler when it comes to duplicate content. An ultimate goal of a website is to offer a solution for users, and the best way to offer a solution is to provide unique content. To fix duplicate content is to make sure that each page as a solid amount of unique content tailored to whatever the page is about. For eCommerce sites, make sure each product has a unique description or user generated reviews to differentiate the content. For other sites, make sure to write unique content for the topic of the page. Also, make sure that your CMS isn’t creating duplicate content by correctly configuring the settings. Eliminating duplicate content will help a website and individual pages perform better for the targeted keywords/topics. By targeting a specific topic on individual pages content marketers can provide unique content that enhances the user experience. Now that you have a handle on your response codes and duplicate content, it is time to dig into the URL structure of a website. The URL structure of a website can play an important part in search visibility. URLs should be concise and keyword rich as much as possible without keyword stuffing. A good way to make sure that a URL is concise with keywords is to use a static URL over a dynamic URL. The static URL should follow the pattern of the navigation and how people navigate throughout the website. By making the URL structure follow the navigation format, you will create a hierarchy that helps search engines associate certain pages together as opposed to a flat URL structure. There are other situations that URLs should stray away from. For example, there shouldn’t be any underscores or uppercase letters in a URL structure as search engines handle them differently. URL structure is an important aspect of technical SEO that should be taken into account early on to reduce any potential issues over time. One thing to note, do not change the URL structure of your website for the sake of SEO. Changing the URL structure is a strategy that should only be applied when appropriate. Next, you need to make it easy for search engines to crawl your pages. XML sitemaps help search engines crawl and index pages throughout a specific section or the entire website. It is important to include all the pages you want indexed within the XML sitemap. XML sitemaps are typically one of the first areas of the site that is crawled. Search engines will crawl the XML sitemap looking for any pages that are new or that have been updated. I recommend building out a XML sitemap index that contains individual sitemaps for videos, images, or other types of content instead of having one mega XML sitemap contain every page. Sometimes we’ll uncover that a website has multiple XML sitemaps that contain pages that shouldn’t be there, which results in the pages being indexed. For example, you don’t want to include a thank you page containing a download link in Google’s search index so people can download your asset without filling out the information you are looking for (i.e. email address, name, etc.). XML sitemaps are an important part of any website, and auditing the pages included should be done continually. By completing the first four items that I have covered you are already making it much easier for search engines to uncover your content. To make your website perform even better it is time to address any site speed issues to make your great content load quickly for your readers. Faster websites help provide a better user experience and can lead to better performance for organic traffic. Google and other search engines are focusing more on providing websites that can load fast. It is especially important if you are running an eCommerce website, as a slower website can lead to lower sales/revenue. There are multiple other areas to focus on to improve website speed, but I recommend starting with the areas that can be easily implemented. Addressing your website speed is a little more technical than the other issues in a technical SEO audit, so work with your developer to solve any site load issues. Making your website load quickly will help your content be found easier and offers a great user experience. Why is a Technical SEO Audit Important? A technical SEO audit can help outline key issues that are holding a website back. Although there are many items to check while conducting an audit, the most important part is prioritizing each issue to align with company goals and how quick the impact will be once implemented. Each website will prioritize issues differently to achieve results fast especially since some tasks will require more resources. If you need help running a technical audit on your website, contact us for a free consultation. Great tips to improve visibility of a site. However, I would appreciate if you could explain how to conduct technical SEO to resolve issues related to image optimization or CSS. Technical SEO issues are create to many problems such as web pages are slow loading, duplicate content etc . 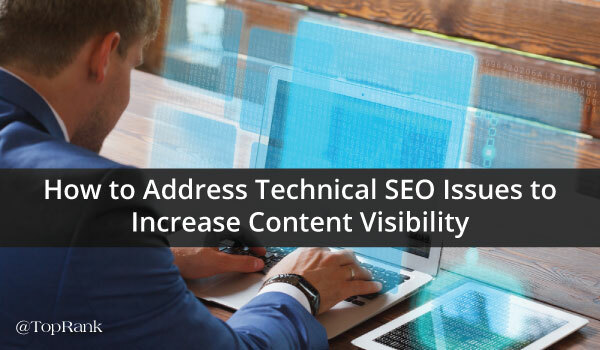 these issues are basically impact on the search engine so, thank you for sharing these issues in detail which helps to reduce technical seo issues. That are the most important terms in SEO you can’t use Duplicate Content and You have to optimize your website URL With Main and important Keywords. and Reduce Server Response time if your webpage have loading time to long then it will show you few errors like Server Error Response Code 500 and 200 many types of Error. Hi Kevin, It’s a great topic you brought up! Thank you for addressing these issues. Duplicate content, broken links and loading slowly can deter customers from coming back decreasing the users experience in your website. Understanding how the website works and knowing how to address technical issues is a priority to have a well optimized website. Getting IT team to implement technical SEO audit is an important thing to get the success to remedy these issues. 🙂 Thank you for these valuable SEO tips!